Wheat berries are whole, unprocessed kernels of wheat. As grains, wheat berries are high in fiber, low in fat, and have zero cholesterol. They are delicious in a salad with a citrus vinaigrette as well as a wonderful addition to chili. They are also very good blended with lentils or brown rice. Wheat berries can be used in any recipe calling for rice. Wheat berries are among the grains which require long cooking, so plan on simmering them for 60 to 75 minutes. You can speed the process by soaking overnight or by pressure cooking for approximately 15 - 20 minutes. Wheat berries can be found in the cereal, self-serve bulk foods or natural-foods section of your supermarket. "Whole Foods" at Fresh Pond in Cambridge carries wheat berries and other healthy grains. 1. In a jar with a tight-fitting lid, combine the oil, orange rind and juice, lemon juice, thyme, and garlic. 2. Cover tightly and shake well. 1. 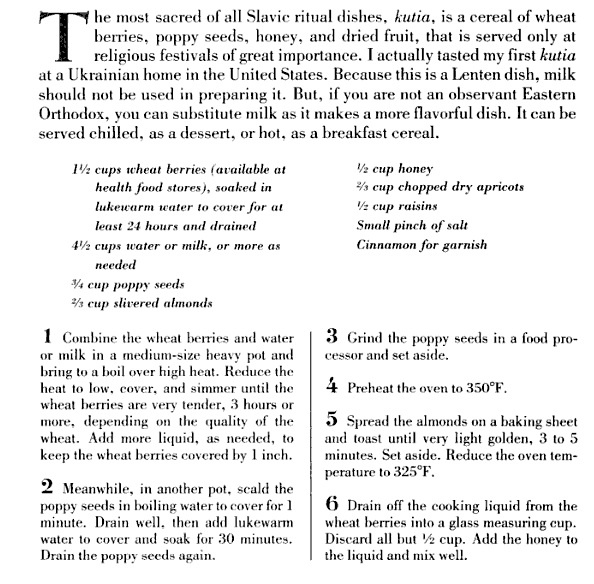 In a saucepan over medium-high heat, toast the wheat berries, stirring constantly, for 4 minutes or until they begin to pop and emit a nutty aroma. Transfer to a bowl. Add cold water to cover, stir well, and cover with plastic wrap. Soak at room temperature for 1 hour or refrigerate to soak overnight. 2. Drain and rinse the berries. In a saucepan over medium-high heat, bring 2 1/2 cups water and the salt to a boil. Add the berries, cover with a lid, and simmer gently for 1 hour or until the berries are chewy-tender and most of the liquid (or all of it) is absorbed. Remove from the heat and let stand, covered, for 5 minutes. Fluff with a fork. 3. Tip the berries into a large bowl. Poke a few holes in the squash with the tip of a knife. Microwave squash until the squash is just soft to the touch. Or bake in the oven at 375° until just soft to the touch. Remove from the microwave, while handling with hot pads, cut squash in half. When cool enough to handle, scoop out the seeds. Cut the squash into ¾ inch pieces. Heat oil in a large skillet over medium heat; add onion, garlic and bell pepper. Cook for 3 minutes, stirring often. Add squash, wheat berries, broth, sage, thyme and salt and pepper. Heat for a few minutes until warm and broth is absorbed. Source: Wheat Berry Recipes http://www.doctorgrandmas.com/recipes/wheat-berry-recipes. In a large stockpot heat oil over medium heat, add optional meat, and cook until brown. Add garlic and onions and Italian seasoning and cook for another minute. Add stock, water, wheat berries, celery, pepper, carrots, and bring to a boil. Reduce heat to low. Cover and simmer until wheat berries are almost tender, about 1 hour and 15 minutes. Stir in chopped spinach, tomatoes with juice, and beans. Cook for about 10 minutes. When ready to serve, ladle soup into bowls. Sprinkle with Parmesan, if using. Bring water or broth to a boil. Add wheat berries and cook for 1 hour to 1 hour 15 minutes. Sauté onion, celery, mushrooms, pepper and carrots in olive oil. Mix vegetables and wheat berries. Add bay leaf, thyme and parsley. Simmer for 30 minutes or until berries are tender. Ideas for vegetables: mushrooms, carrots, celery, onions, turnips or rutabagas, potatoes, eggplant, winter squash, red or green peppers, yams or pumpkin. Cook wheat berries in broth for an hour with olive oil, thyme, basil, and garlic. Add the vegetables in the pot with the wheat berries. Add parsley, peas and soy sauce; simmer for 5 minutes. Bring wheat berries to boil in 3 ½ cups of water, then simmer for about 60 – 75 minutes. If necessary, add more water. Toast the pecan pieces on a baking sheet at 350˚F for 6 to 8 minutes. Mix with the berries and remaining ingredients. This tasty dish is loaded with nutritious ingredients. Cook wheat berries in 3 cups of water for 1 hour until tender; add more water if necessary, drain thoroughly. Brown optional meat in a 4-quart pot; add onion, and peppers for a minute or two. Add the remaining ingredients, bring to a boil and simmer uncovered for about an hour. Stir occasionally. Wheat berries are very hearty, with a chewy texture, and a slightly nutty flavor. They are delicious in a salad with a citrus vinaigrette as well as a wonderful addition to chili. This delectable chili is based on an EatingWell magazine recipe. After sorting through 2 cups of uncooked wheat berries and removing any stones, rinse well under cool running water, and place in a large pot with 7 cups of water and 1 tsp salt. Bring wheat berries to a boil over high heat, cover, reduce heat, and simmer for 1 hour, stirring occasionally. Heat oil in a Dutch oven or large pot over medium-high heat. Sauté onions, garlic, chili powder, cumin, oregano, ½ tsp salt and pepper until onions are translucent. Add beans, tomatoes, chipotle pepper, broth, and brown sugar, and bring to a boil over high heat. Reduce heat, cover, and simmer for 25 minutes. Stir in two cups of the cooked wheat berries and cook for another 5 minutes. Serve over rice and garnish with diced avocado. Source: My Food Geek http://www.myfoodgeek.com/2007/03/09/wheat-berries/. There are generally two kinds of wheat berries available at natural foods stores: hard (high-protein), which are reddish brown, and soft (low-protein), which are blond. We prefer the chewiness of the hard variety for this recipe. Cook wheat berries in a 4-quart pot of boiling water (not salted), uncovered, until tender, 1 to 1 1/4 hours. Drain in a large sieve and rinse under cold water to cool, then drain well. Whisk together vinegar, salt, and pepper in a large bowl. Add oil in a slow stream, whisking until combined. Add wheat berries, onion, and dill and stir to coat well. 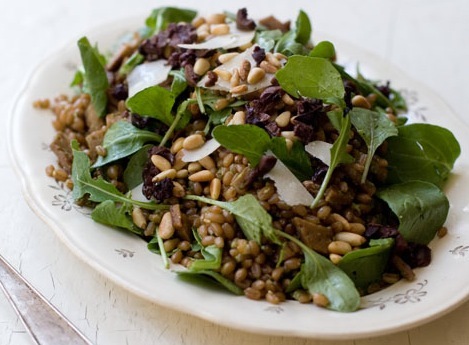 Source: Gourmet | July 2004 http://www.epicurious.com/recipes/food/views/Wheat-Berry-Salad-109649. This is a delicious whole grain salad. The texture of the wheat berries, wild rice, pecans, and cranberries is fantastic. The flavor combination is wonderful. 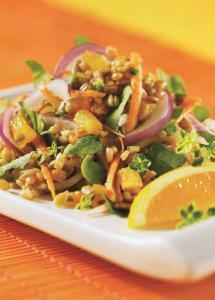 If you have never tried a wheat berry salad then this is a great way to do so. Serve it over a bed of fresh spinach, and accompany it with grilled shrimp. Toss the spinach in some olive oil and lightly salt it with a pinch of kosher salt before topping it with the wheat berry salad. Soak the wheat berries overnight in cold water, covering them 3 inches. Drain the water in the morning. Boil the wheat berries in 6 cups of water for about 50 to 60 minutes, or until tender. Add more water as necessary to keep wheat berries covered during cooking. Drain excess water from the wheat berries when done. In another small pot, boil 2 cups of water. Add the wild rice and simmer for about 45 minutes, or until the rice begins to split. I prefer to undercook the wild rice slightly so that it retains some structure. Drain excess water. 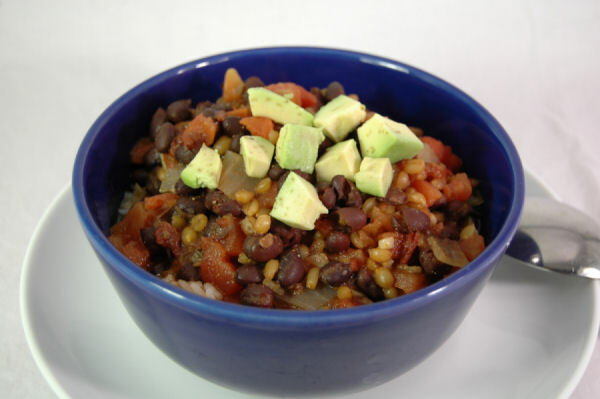 Combine the cooked wheat berries and wild rice in a large bowl. Whisk the lime juice, honey, mustard, salt, and pepper to make the dressing. Add the dressing to the wheat berries and wild rice, mix thoroughly. Now add the cranberries, pecans, parsley, and green onions and combine well. 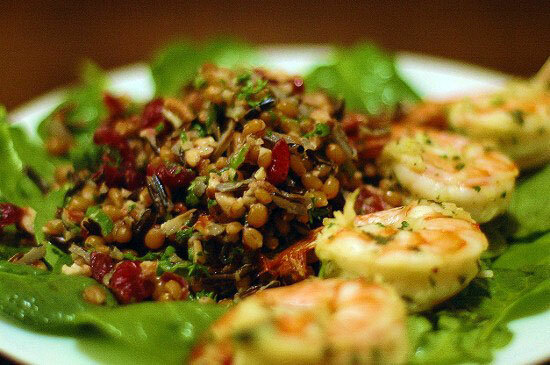 Source: Whole Grain Gourmet http://www.wholegraingourmet.com/recipes/46-salad/33-red-wheat-berry-salad.html. In a large stockpot combine lentils, broth, and water. Bring to a boil over high heat; then reduce heat, cover, and simmer gently until the lentils are tender but not mushy, about 25-30 minutes. Heat oil in a large skillet over medium heat. Add carrots, onion, salt and pepper. Cook, stirring occasionally, until the vegetables begin to brown, about 10 minutes. Add garlic and cumin and cook, stirring constantly, for 30 seconds more. Remove from heat. When the lentils are tender, stir cooked wheat berries and chard into the pot. Simmer until the greens have wilted, about 5 minutes. Stir in the carrot mixture and lime juice. This is a recipe that provides dark greens and whole grains - a nutritious powerhouse lunch or dinner. Mix all ingredients. You can add chicken, turkey, shrimp, tuna, salmon, or other fish if you prefer. Stir all dressing ingredients together and set aside. Mix wheat berries, chicken, apples and raisins. Add dressing and toss. Serve on spring greens and sprinkle with slivered almonds. Mix dressing ingredients. Add to other ingredients and toss. Serve and sprinkle with chopped peanuts. Mix dressing ingredients and set aside. Mix wheat berries, apple, avocado, pepper, peas, shrimp and eggs in a bowl. Add the dressing to the wheat berry mixture and mix together. Mix the dressing ingredients well and set aside. Sprinkle dressing on other ingredients and toss. Mix together the dressing ingredients; set aside. Gently toss all ingredients with the dressing. Serve at room temperature, or chilled. Mix the dressing ingredients and set aside. Pour dressing over other ingredients and toss. Toss eggplant, red pepper, onion, patty pan and butternut squash in oil to coat. Wrap vegetables in foil and roast for 20 minutes in 400ºF oven. Remove the foil and continue baking at 425ºF until lightly browned. While vegetables are roasting, bring chicken stock to boil. Pour stock over wheat berries. When the vegetables are finished, remove the skin from the red pepper and slice the flesh. Gently toss the remaining ingredients, with the cooled roasted vegetables and dressing. Mix the dressing and set aside. Pour dressing over the wheat berry mixture, and toss gently. Source: Doctor Grandma's Newsletter http://www.doctorgrandmas.com/newsletter. In a medium pot, combine wheat kernels and milk. Reduce heat, cover, and simmer 3 hours. Add more liquid as necessary to keep kernels covered. Scald the poppy seeds with boiling water, drain, and add lukewarm water to cover. Soak 30 minutes, drain and grind in a food processor. Drain water from wheat kernels and keep 1/2 cup of the liquid. Add the honey to the liquid and mix well. Mix kernels, honey, ground poppy seeds, almonds, apricots, raisins, and salt. Bake in a 2-quart casserole dish, uncovered, at 325 degrees for 20 minutes. Kutia may be served warm or chilled, and sprinkled with cinnamon, but it is best when prepared several days ahead of time in order for the full flavor to develop. Kutia can be refrigerated for up to two weeks. Cook wheat in 3 cups water till tender on medium heat, about 1 hour. Keep an eye on it so the water does not evaporate. I usually find 30 minutes is enough and I don’t need to drain it either. Place cooked wheat, half at a time, in a blender container; cover and blend into a paste. In small saucepan cook poppy seed in 1 cup boiling water till soft, about 10 minutes. Drain. Mix together wheat paste, drained poppy seed, raisins, walnuts. Honey, almonds, and vanilla. Chill. Stir in unwhipped cream. 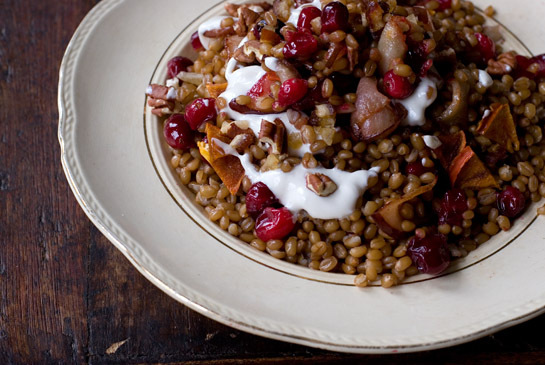 Kutia is usually made with whole wheat berries and served for Christmas Eve. This requires soaking for many hours and cooking for a long period of time. With the cracked wheat it takes less time and is very good indeed. It can be served as a dessert. You can make it without blending the cracked wheat cereal into a paste and you can omit the almonds. Grind the drained poppy seeds in a blender, use the coarse grain bulgur and toast the walnuts or pecans. Bulgur is the Turkish word for cracked wheat berries. It is made by cracking kernels of partially cooked or roasted wholewheat berries. Bulgur is known as the rice of the Middle East. It usually comes in three grinds: coarse, medium and fine. Medium and fine grinds are used in salads; the coarse grain is used in pilafs. Bulgur’s fine nutty flavor complements meat, poultry and fish. Use Red Anjou Pears or any firm, flavorful pear. Whisk the yogurt and maple syrup together and set aside. In a large skillet over medium-hight heat, sauté the pear slices in the olive oil and butter for about five minute, or until they get a bit golden. Keep an eye on them though, because they can burn in a flash. Toward the very end, stir in the cranberries and cook for another minute or so - just until the cranberries soften up a bit and a few of them begin to split open. Add the wheat berries to the skillet and toss gently. Turn out onto a platter, or serve in individual bowls ladled with a generous amount of the maple yogurt, and sprinkled with plenty of pecans and dried fruit. Serve more maple syrup on the side. *To cook wheat berries: Combine 2 cups wheat berries, 6 cups water, and 2 teaspoons salt in a large saucepan over medium-high heat. Bring to a boil, lower the heat, and simmer, covered, until plump and chewy (and a few of the berries split open), about an hour or so. The berries will stay al dente, and the only way to be sure they're done is to taste a few. Drain and set aside. Place all ingredients in the crockpot in the evening. Stir to mix. Cook on low over night. Serve in the morning with milk and brown sugar. Wheat berries are whole, unprocessed kernels of wheat. They can be found in the cereal, self-serve bulk foods or natural-foods section of your supermarket. 1 bag (12 oz) frozen corn or fresh corn, scraped from cob. In 2-quart saucepan, heat water, wheat berries and 1/2 teaspoon salt to a rolling boil over high heat. Reduce heat to low; cover and simmer 1 hour 15 minutes to 1 hour 30 minutes or until tender. Drain; rinse with cold water to cool. Drain well. Meanwhile, heat oven to 450°F. In ungreased 15x10x1-inch pan, evenly spread corn. Drizzle with 1 tablespoon oil; sprinkle with 1/2 teaspoon salt. Bake 15 minutes to roast corn. Set aside. 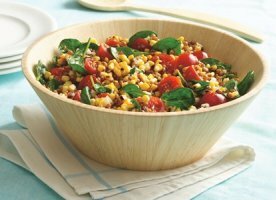 In large bowl, stir together wheat berries, corn, spinach, tomatoes and onion. In 1-cup measuring cup, mix dressing ingredients with wire whisk until well blended. Stir into salad. Let stand 15 minutes before serving to blend flavors. Makes 4 servings or 6 as a side. Place the wheat berries in a large mixing bowl and set them aside so they can come up to room temperature if you've had them in the refrigerator. In the meantime, make the arugula pesto by combining the garlic, 1/2 cup of the pine nuts, most of the arugula, Parmesan, salt, and lemon juice in a food processor. Pulse a few times, and then begin to drizzle the olive oil into the mixture while continuing to pulse until the pesto is smooth. Taste, and adjust if needed with more salt or lemon juice. Pour about half of the pesto over the wheat berries, add the seitan if you are using it, the reserved arugula, and about 1/4-1/2 cup of hot water (or reserved water from cooking the wheat berries). Toss until everything is well-coated. Add more pesto a bit at a time until the wheat berries are dressed to your liking - I actually go a bit on the heavy side with this particular combination. Arrange on a platter and top with the olives, remaining pine nuts, and a bit of shaved Parmesan. Per serving: calories 173, fat 3.6g, 17% calories from fat, cholesterol 8mg, protein 13.1g, carbohydrates 25.6g, fiber 13.2g, sugar 3.3g, sodium 177mg, diet points 1.6. 1. Preheat oven to 350°F (180°C). Spray an 8 1/2-inch x 4 1/2-inch (21.25 cm x 11.25 cm) loaf pan with cooking spray. 2. Combine flour, baking soda, salt, baking powder, nutmeg, cinnamon and allspice in a medium-size mixing bowl. 3. Place egg substitute, sugar, vanilla, pineapple and zucchini into the Vitamix container and secure lid. 5. Turn machine on and quickly increase speed to Variable 4. 6. Blend for 10-15 seconds. Stop machine and remove lid. 7. Add dry ingredients to the Vita-Mix container and secure lid. 9. Blend for 20 seconds or until mixed. 10. If necessary, use the tamper to press any ingredients into the blades. Do not over mix. 11. Stop machine. Stir in nuts and raisins by hand. 12. Pour into prepared loaf pan. Bake for 60 minutes or until a knife inserted into the center comes out clean. Alternately, use 1 cup (120 g) whole wheat flour in place of wheat berries. Wheat Grass refers to the young grass of the wheat plant. Wheat Grass has high concentrations of chlorophyll, active enzymes, vitamins, minerals and other nutrients. It is said that Wheatgrass' health benefits range from providing supplemental nutrition to having unique wellness properties. Consumers can now grow and juice wheatgrass in their homes. Wheat Grass is often available at juice bars. It can be drank alone or mixed in fruit and/or vegetable drinks. Choose a container appropriate to the amount of wheat grass that you want to grow. Fill the container with organic potting soil. Leave enough room from the top of the container to cover seeds with about 1/4 inch of soil. (Purchase, a clean, fresh potting soil or mixture. Do not use yard or garden dirt because it may contain bugs, pesticides or chemicals.) Most home improvement stores carry a suitable organic soil. Add water to completely moisten soil. Place in a warm, dark location. NEVER add pesticides or fertilizers. Once growth is visible, place container in a sunny location. Always make sure that soil is moist. DO NOT OVER WATER. When sprouts are about 4 to 6 inches in height, they are ready to cut and juice. Sprouts appear in about 4 days. Sprouts will naturally mature and wither in about 14 to 20 days. Add them to your compost pile to biodegrade. Always keep a fresh grass growing. We suggest starting a new pot every week so that when one pot is used, a new fresh pot is always ready for juicing.